← Thirty, Flirty and…Little Piggy Bread! As I was approaching my big 30th birthday, I hemmed and hawed between all sorts of ways I wanted to spend my birthday. I was having a bit of a bi-polar type crisis over it. One day I’d be thrilled and thinking about throwing a party, and the next I’d freak out and wonder about possibly skipping town for the weekend or doing nothing at all. Ultimately I decided on putting my favorite things together. 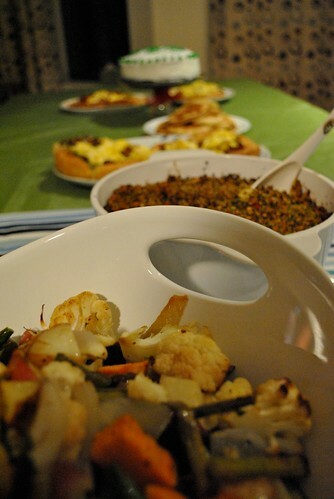 I love throwing my little dinner parties, and this was a great reason to have another one. I love breakfast. 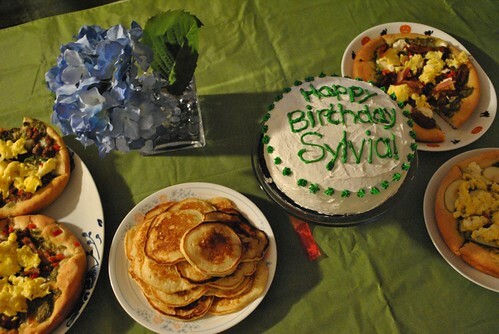 So, I threw them together and had a Birthday Breakfast for Dinner Party at ChezSylvia. 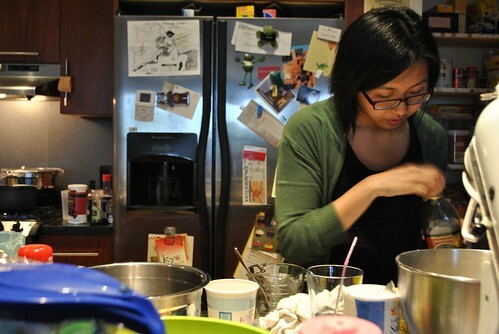 Welcome to my super messy kitchen! A little while back, I had made a variation of the Pepperoni Pan Pizza from Cook’s Illustrated (American Classics 2009 Issue). The crust that resulted was amazing. It was light, crispy outside, soft inside with just enough chewiness, but easy to pull apart. So, I decided that for these breakfast pizzas, I would use that dough and various topping choices. Instead of tomato sauce, I made a Spinach Pesto from Closet Cooking (my herb combo was dill, parsley and basil). I topped each pizza differently with a mixture of diced peppers, mozzarella cheese, maple breakfast sausage, bacon, goat cheese and apples. 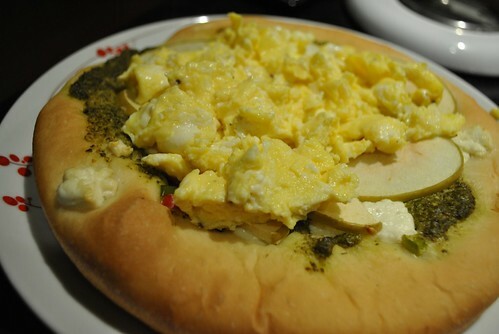 Once they were all done, every pizza was topped with a healthy dose of scrambled eggs. The difference between last time and this time was the way I proofed my dough. I had my oven on to roast veggies and the mac and cheese, so proofing in a warm oven was not going to be possible. So, in my infinite wisdom, I decide to proof the dough near the vent of the oven on top of my stove top. It was warm there, it should work right? No, not so much. It is hot there, and the bottom of my dough actually started cooking a bit! I just ignored the cooked spots and continued, and in the end, you couldn’t tell anyway. Next time, find another place to proof! 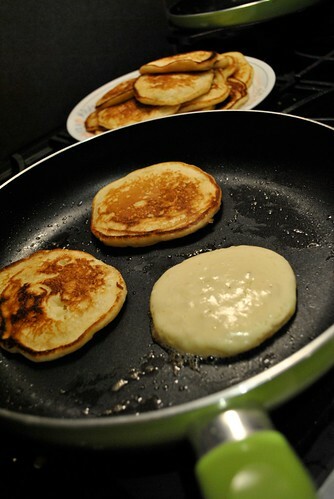 Originally, I wanted to make an epic Pancake Cake. It was essentially going to be layers of banana pancake, sliced strawberries and a maple whipped cream. However, given the time in which I actually had dinner ready, we opted to instead just make buttermilk pancakes, Alton Brown style. Or in other words, from his I’m Just Here for More Food cookbook. J had never made pancakes from scratch before, so I let her do this one. The recipe is super simple and made mostly with stuff you would find in your pantry (flour, baking soda, baking powder, sugar, buttermilk, eggs and butter). I had buttermilk this time, but if you don’t just made the pseudo buttermilk, and it will be just fine. My usual go to dish that is easy, feeds a crowd and simple to tailor to the crowds preferences and what is on sale/in season. This mix consisted of cauliflower, three types of potatoes (sweet potato, red potatoes and purple potatoes), onion and asparagus. 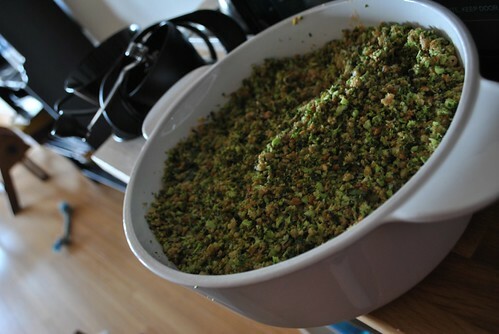 Tossed in extra virgin olive oil, S&P, dill and parsley (what I had on hand from the Spinach Pesto). Roasted at 400 degF until the potatoes are done. I really do love this recipe from 101cookbooks.com. However, when I make it, I do omit the butternut squash (for no reason other than it takes more time to roast and I had no squash on hand), swap in Greek yogurt for the sour cream and this time used red cherry tomatoes instead of the yellow (I couldn’t find them at the market). Best served hot. Luke warm is good, just messy to serve. This fruit salad was epic. 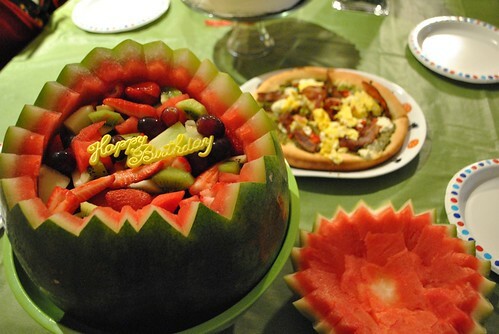 Y&A had brought a fruit salad they made inside of the emptied out watermelon. It was so awesome! They even froze the fruit before mixing it together for maximum coolness at time of serving. They had all kinds of fruit in it and it was the perfect way to end a meal. I made another batch of ice cream! Following the same recipe as before, but this time, I subbed 1 teaspoon of vanilla extract for the vanilla pod, and added 3 tablespoons of instant espresso powder in with the milk as it heated up. 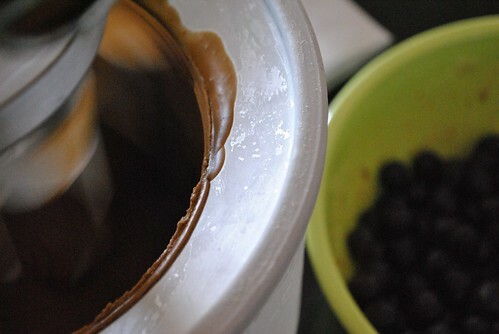 I also added in 2 pints of blueberries lazy mushed in a little bit of sugar in the last few minutes of churning. The result? A really awesome coffee ice cream and frozen blueberries. Next time I have to figure out how to add fruit so it doesn’t freeze. J made me a chocolate cake for my birthday! 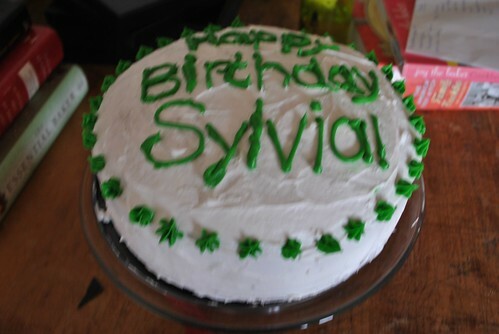 I love the green lettering and the cake itself was super moist, chocolatey and not overly sweet at all. 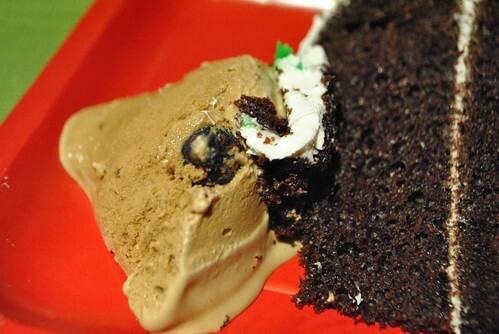 Mixed with the ice cream, it was amazing. 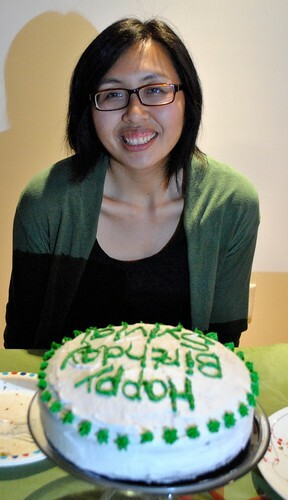 Thanks to everyone who made this birthday absolutely wonderful. Without you guys, turning 30 wouldn’t have been fun at all. Thanks for the breakfast cupcakes, the brunch, the run and post run breakfast, more breakfast, coming up and letting me cook you dinner, coming out for dinner, texting and writing on my wall (that will be the most action I get on Facebook all year!). It was a big day...Cake time! This entry was posted in Breakfast, Cake, Dessert, Dinner, Fruit and tagged breakfast, dinner party, pizza, thirty. Bookmark the permalink.